Almost every industry is looking at the impact artificial intelligence (AI) will have on it, but healthcare has been one of the most forward-looking because it has the potential of providing better patient care and can save lives. The intersection of healthcare and AI has tremendous potential, and it’s because there are well over 100 start-ups focused specifically on bringing AI to healthcare. Over the next several years, the innovation in this area will explode as the ecosystems of companies in this area grow. At Nvidia’s GPU Technology Conference (GTC) in Washington, D.C., this week, Ian Buck, general manager and vice president of accelerated computing at Nvidia, discussed how we just passed the “big bang” of modern AI where the technology will revolutionize the way we do things. For example, in healthcare, AI-based video analytics are helping radiologists find brain bleeds or tumors in MRIs that might be missed by the naked eye. This isn’t being done everywhere yet, but it is one of the more widely used examples of AI in healthcare, as machines can see things at a more granular level. Modern AI takes the process to the next level. Buck showed a slide with a monochrome image of a chest x-ray. AI was then used to color the organs different colors and then the image was sharpened to make it look three dimensional. (See below.) This is a process that Buck called “AI Super Resolution” where a neural network can take a highly pixelated image and sharpen it. Buck showed another use case where an X-ray of a hand was taken and super-resolved, bringing forward elements of the image that were not visible before. Another example of modern AI in healthcare is precision treatments. With the medical industry today, patient treatments are given based on illness. Factors such as age, ethnicity, and body composition are not considered. With enough data, AI can be used to develop a treatment plan that is specific to the individual. Everyone is unique, but the process of creating a custom treatment plan is far too complex for a doctor to develop manually. AI is proving to be an excellent tool to enable patients to receive precise levels of medication. AI can also be used to predict outcomes. In one of the sessions in the healthcare track, the panel discussed how a person’s muscle-to-fat ratio is predictive of a wide range of medical outcomes, including surgical success and cancer prognosis. AI- based analytics can take CT scans that show body composition and instantly segment information, enabling datasets to be created for biomarker discovery. Clinicians can use this data to predict if a patient has a high likelihood of a particular illness or disease. Modern AI will transform healthcare faster than ever before. One challenge remains, though, and that’s data. The medical industry shifted to electronic records years ago, but the data tends to live in silos. I recently interviewed a doctor from Boston-based Massachusetts General Hospital, one of the leading hospitals in the country, and he can’t access some of his own records from his remote office in Waltham, Massachusetts. He routinely emails documents to himself or has patients hand carry printed paper records. There are hundreds, sometimes thousands, of datasets that exist in silos in every major hospital, so the inability to bring this information together will hold back modern AI in hospitals. 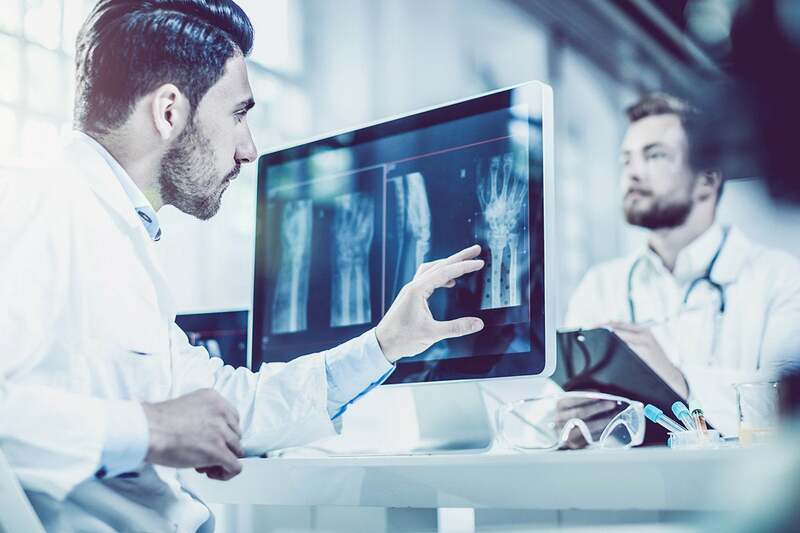 GPU-based servers are widely available and AI algorithms have matured, but data availability remains healthcare’s biggest problem. I asked Neil Tenenholtz, senior machine learning scientist at the Mass General and Brigham and Women’s Hospital Center for Clinical Data Science, about what can be done to improve the quality of data. He admitted it’s a big problem and recommended starting small with either the most important sets of data or with the systems that were already available hospital-wide. That’s a start, but eventually, data standards need to be put in place and information silos brought together. As an example, many clinical reports are nothing more than prose written by doctors with no common structure and format. This makes it very difficult for an AI to parse and to extract meaningful information. Advancements are being made in AI where natural language processing (NLP) can be used to better understand the reports, but creating a standardized structure would certainly help. Also, moving to centralized storage systems would be a significant improvement over storing electronic records on a local server that are found in remote offices. In my opinion, every individual should have their own personal “health cloud” where all pertinent records, test results, and other data can be stored. The patient can then decide who should be given access. This would enable AI algorithms to have access to all of a person’s information instead of just a slice of it. We’re likely years away from that, but in the meantime, CIOs in the healthcare vertical should be focused on data standardization and centralization because that will help advance the use of AI.